Formerly: blue morocco and boards, portfolio with ties. Purchased by J.P. Morgan (1867-1943) in 1932. Made for the convent of Nuestra Señora Santissima Maria la Real, Seville, Spain, in 1740; given to J.P. Morgan (1867-1943) by Mrs. Crooby (? ), Christmas 1932. Ms. Dominican formulary; written and illuminated in Seville, Spain, in 1740. 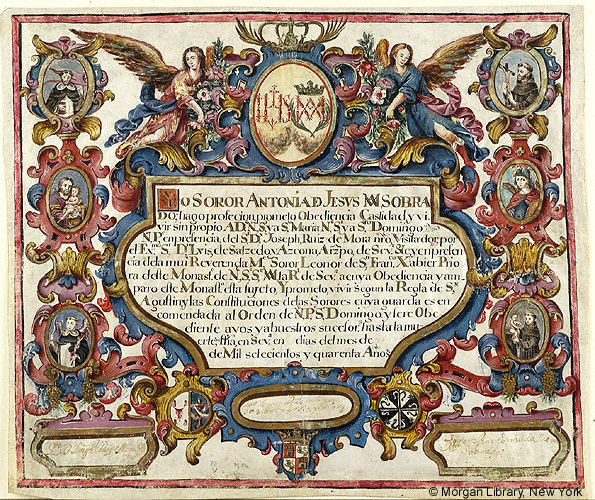 Decoration: text written in contoured space surrounded by painted decoration imitating an elaborate carved frame; above the text 2 angels support a large medallion containing the initials I H S and a crowned monogram designating the convent of Nuestra Señora Santissima Maria la Real; 3 oval medallions on either side of the text contain busts of saints; below the text are the arms of Spain flanked by two medallions, one with the Franciscan emblems of the five wounds of Christ and crossed arms before the Crucifix and the other with the Dominican Cross.